Overcoming barriers to find value in agricultural technology. They say the digitalization of the world is the fourth industrial revolution. But look away from the Twitterverse, tablets, smartphones and 219-inch televisions for a moment, and you’ll recall that not everyone has access to, interest in or a need for this burgeoning technology. Similarly, the field of ag has been slower to overturn in the face of technology. 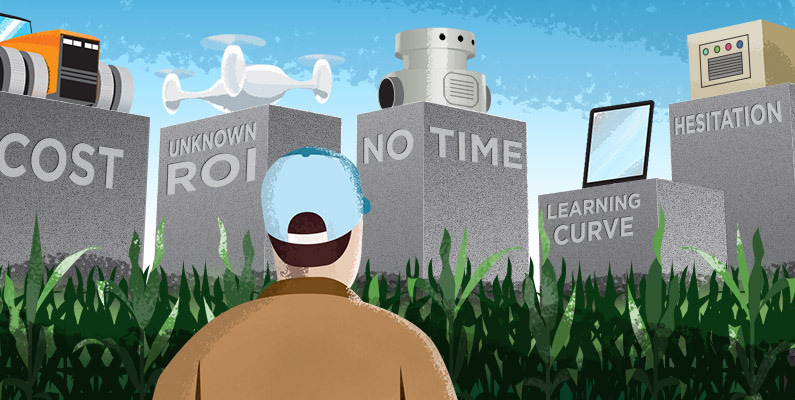 Though far advanced from more traditional plowing and planting mechanisms, parts of ag lack digitization, with a population that is sometimes reluctant to get on board and few major players. Likewise, because of the seasonality of ag, research and development are lengthier than other industries that might not necessitate the same schedule. Therefore, the process of technology production takes longer to establish in an industry already on an alternative organizational structure. However, as Precision Farming Dealer notes, the “ ‘No-Till Farmer’ Operational Benchmark Study forecast increased adoption of 11 precision technologies in 2019, compared to last year.” Of those, variable rate fertilizing and satellite aerial imagery have the most significant gains, up 10.4 percent and 9.1 percent from 2018, respectively. The crux of this is that precision ag is growing exponentially. What we are capable of achieving today through technology is just a fraction of what we will be able to accomplish 5 to 10 years from now. And as marketers, we must recognize the barriers to technology adoption and find a way to overcome these obstacles. In a recent conversation with Brian Magnusson, Vice President of Technology and Innovation with Lindsay Corporation, a leading manufacturer of irrigation systems, we discussed the barriers to technology adoption on the farm and how ag marketers can make technology friendlier and more accessible. Timing isn’t the only slowpoke in precision ag. Accessibility to education with these technologies is a challenge, with training reliant on product reps and Extension educators. If the education isn’t easily accessible or available, the only option is for one to fiddle with the apps and mechanics themselves, and it’s no surprise the hesitation to touch, swipe or enter information into the black hole of our technology and mobile devices. Precision ag is a data-driven intangible that often comes at a significant capital investment. Until there are results over time, which is another substantial expenditure, it’s an extra challenge to prove any worth for the product. The high cost and lack of results are enough to make anyone pause before purchase. Ag tech has already proved valuable to Silicon Valley, but it needs to prove its value to its consumer, the farmer and agribusiness owner. And that seems to be its greatest challenge, creating engagement in ag to recognize the benefit behind the technology. “Farmers don’t want more data, they want more insights out of the data, valuable recommendations and insights that help them make decisions that improve their bottom line,” said Magnusson. “Farmers really want and need technologies that simplify their life, simplify their operations and allow them to get their job done more flexibly on their own terms.” More specifically, he’s looking at putting those decisions into action, remotely tracking results, minimizing the amount of time looking at a dashboard on a daily basis and moving to a structure that relies on alerts when systems aren’t working as they should. Methods of awareness: production of more comprehensive, yet straightforward educational content through workshops, events, webinars and in-app tools. Keep in mind the goal – what are the insights that the farmer and ag consumer can derive from the product? Generate connections: customer service is essential for any lucrative sales experience, but this extends beyond meeting needs. Establishing a relationship with customers will not only keep them updated on changing technology and continuing education with the product, but it will ease the anxieties they may feel in jumping into the customer journey. Participate in engagement: Brands and businesses value opinions and feedback from farmers, whether it’s in person or online. Encouraging customers to use their voices, experiment, sample and suggest is all part of the digital experience. Similarly, there may be opportunities through market research and value-added or incentive programs that can educate and encourage farmers to be more proactive to participate. The advantages to precision ag adoption far outweigh being left in the dust, but the technology must be meaningful and beneficial to the time and financial investment. Likewise, the education necessary to facilitate the technology must be an accessible component for successful execution.